Click here to see pictures of descendants. Born April 26, 1863, at Cairo, Louisa County, Iowa. Died August 6, 1943, at Pueblo, Pueblo County, Colorado. Married March 3, 1891, at Walnut, Crawford County, Kansas. 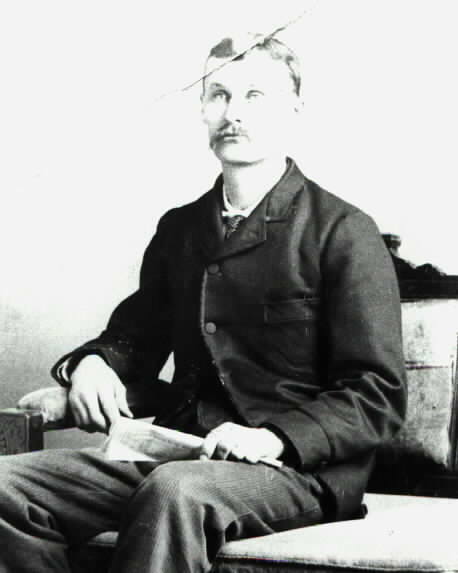 Robert, known as Pem, moved with his family to Crawford County, Kansas, about 1870. He and his wife Mary Josephine ("Josie") Lyness lived at Walnut, Kansas, several years after their marriage. When Josie's father bought her an 80-acre farm in Ford County, Kansas, the family moved there by covered wagon about 1900. The farm was near Wright, and was the birthplace of eight of their children. They lived in a two-room sod house at first, then added a third room. In 1915 a frame house was built, and they moved into it just when their youngest child was about a week old. Pem and Josie then felt it necessary to have more land to support their large family, and the following year filed a homestead in Kiowa County, Colorado on the shore of the NeNoShe Lake. They lived in a one-room dugout until an adobe house was built two years later. Josie was a hard worker, doing much of the field work, often driving four head of horses while farming. She died at age 50 of heart and kidney failure, leaving behind three young children. A married sister (Cora) moved to the homestead then to care for her younger siblings. Later, Bertha and Viola were cared for by Frank Morgan Lyness and his wife Bertha in Spearville, Kansas. Within a month after Josie's death, Pem was jailed for family abuse. He lived to age 80, spending his last years in the Colorado State Hospital. He died of arteriosclerosis. To get to the Kiowa County homestead from Eads, go east three miles on highway 96, then south on highway 287 approximately 12 miles to highway marker 103. The gate is on the left. Take the dirt road going east for about two miles. Then go 1/2 mile south to the only house standing.